A Series of Fourteen Sketches made during the voyage up Wellington Channel in search of Sir John Franklin, K.C.H., and the missing crews of H.M. Discovery-Ships Erebus and Terror; together with a short account of each drawing. London: Day and Son, May 1, 1855. 2° (372 x 275mm). 1p. list of subscribers. 14 tinted lithographic plates on 13 leaves, after May by J.Needham, T.G.Dutton and others, printed by Day & Son. (Marginal spotting.) Original cloth-backed oatmeal-coloured wrappers (disbound, gutta-percha perished), modern cloth portfolio. A fine copy of this rare work. May served as mate aboard the Resolute during the expedition of 1850-1851 and led a depot laying party as far as Cape Gillman on Bathurst Island, travelling 371 miles in 34 days. He also undertook a short exploratory journey around Griffith Island. The present work records his immpressions of the expedition of 1852-1854 when he served as Lieutenant in the Assistance under the overall command of Sir Edward Belcher. During this expedition he undertook a journey during which he covered 600 miles in 62 days. The expedition carried out a great deal of innovative exploration, as well as research in the fields of meteorology, geology, tides, and marine biology, but these achievements were overshadowed at the last by Belcher's justified decision to abandon the Assistance, Pioneer, Resolute and the Intrepid. 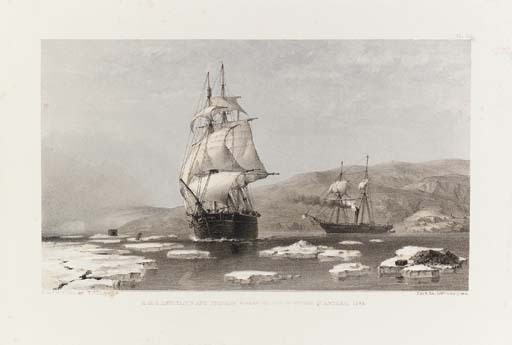 The expedition returned aboard the North Star and the two supply ships Talbot and Phoenix. May retired from the Navy as a Commander in 1854 and went on to a successful career as an artist: the bas-relief on the pedestal of Franklin's statue in Waterloo Place, London, is from his design.